This is the second in a five part series. To read part one, click here. Prince Muhammad bin Rashid, the Saudi minister for Islamic affairs, and half-brother to King Abdullah, enjoyed holding a weekly audience in the palace. For some time he’d been feeding a friend of his, Saeed Ahmed Abdullah, information about how Saeed’s son was killed. Rashid was baiting his friend, hoping he would come to him with a request. When chapter two of Consent to Kill – the eighth book in chronological order of the Mitch Rapp series – opens, Rashid finally got his wish. “I want to have a man killed” pleaded a heartsick Saeed, kneeling before the feet of his friend. Rashid, careful to respond as the room was full of people, initially replied to his friend, “you must not speak of such things.” However, once the room was cleared, the Prince changed his tune. Saeed continued to plead with Rashid, reminding him that all he’d originally asked for was the body of his son so that he could give him a proper burial. He also explained that instead, he was told that Waheed’s body had been defiled by an American who tortured him and intentionally took actions intended to bar Waheed from paradise. “What is it you ask of me?” Rashid finally asked. What Saeed wanted was an eye for an eye. He wanted the man that killed his son to die, and he wanted the Prince to make arrangements to have it done. He knew that Rashid had the connections to do such a thing, stemming back from his days as Saudi Arabia’s minister of the interior – which oversaw police and intelligence services. What Saeed didn’t realize was how joyful Rashid, who’d been his friend since they were nine-years-old, was over this specific request. It all started months before when the heartbroken father came to him requesting more information about his son. Rashid, using some of his old sources, found out a lot about the American than had killed Waheed, who had been serving in Afghanistan. He slowly shared pieces of information with his friend, who was still grieving, waiting for him to seek vengeance. That day was finally here. Trying to hide his excitement, Rashid told Saeed of a man who was very skilled at completing the type of job he was seeking. The man was very expensive, but money was no object for Saeed, who had made billions by first putting up power and phone lines around the kingdom and surrounding areas, and then laying thousands of miles of fiber-optic cable. Rashid promised to have this man, Erich Abel, visit Saeed, and told him to wait for his arrival. In exchange for connecting Saeed with Abel, Rashid only asked for one thing in return: that his friend would never mention his own involvement. Saeed agreed. And with that, Saeed was gone. The Prince was thrilled because his plan was working. The American assassin would be killed, and nobody would ever know of his own involvement. Waheed, Saeed’s son, wasn’t dead. He was captured and tortured by the American they wanted to kill, yes. But dead? No. Secondly, the American they were plotting to kill was Mitch Rapp – and nobody can kill Rapp. Erich Abel, a former German Stasi officer, was a seasoned killer. He was a spy. He proclaimed that he was not a “squeamish” man. Yet, when he heard that the target’s name was Mitch Rapp, his hand began shaking so badly that he had to set his coffee cup down mid-sip. Once the initial shock passed, Erich realized the notoriety he would receive should he be known as the man who killed Rapp. That made him excited. Within seconds, Abel decided he wouldn’t do the “heavy lifting” of the job. No, he’d find someone else for that. Saeed’s assistants brought in a couple of large black briefcases, then set them down and left. Saeed offered Abel ten million dollars to take the job, all of which was in cash – inside the brief cases. Erich had never heard of a ten million dollar fee for a contract killing before. Sensing that Saeed wanted Rapp dead for personal reasons, and trying to exploit the fact that the man was worth billions, he countered by asking for twenty million dollars. Without hesitating, Saeed shook his hand and agreed to the deal. Rashid wanted Rapp dead, but did not want to be connected to the assassination for fear that Mitch – should he survive – would find out. So he baited Saeed, hoping he would kill Rapp. Saeed wasn’t willing to kill Rapp himself, either, even though he also wanted Mitch dead. So he too sought out someone else to do it. Erich, the former Eastern Germany spy, took twenty million bucks, but even he didn’t want to be the one to kill Mitch! How many guys does it take too kill Mitch Rapp?! Driving his new silver SL 55 AMG Mercedes, a gift for himself after receiving his first payment from Saeed, Erich retreated to his small getaway home in the mountains of Western Austria. Excited to finally own the world’s top performance sedan, which cost him $125,000, he was eager to find someone else to do his dirty work. So Erich called Dimitri Petrov, an old KGB friend, and told him they needed to meet as soon as possible. With the promise of fine food, expensive wine, excellent cigars and ten thousand dollars, Petrov agreed to travel to Abel’s secluded home. After dinner, while relaxing under wool blankets on the porch, Erich asked his friend for advice. Explaining to Petrov that he’s looking for a contract killer who thinks he’s the best, and eager to prove to others that he is, Erich is given the number of one of the best killers in the world – Louie Gould. Seriously, all these bad guys want Rapp dead, but none of them have the stones to try and take him out themselves! Continuing the trend of wanting to kill Mitch by paying someone else to do the job, Abel hired Louie Gould to take out Rapp. Traveling to Paris, Abel begins his recruitment of Gould. First he had to meet with Louie’s partner, who is also his wife. The meeting didn’t go very well, so Erich ate dinner alone and then retired to his hotel – where unbeknownst to him, Louie was waiting for him. After a lengthy conversation that really should be read, not summarized, they agreed to a price. To kill Mitch Rapp, a man he admired, Gould demanded seven million dollars. I’m not going to get too involved explaining Gould’s role in all of this, because frankly, Louie is definitely high on my list of the best villains in the Rappverse. You’ll read much, much more about him in a later post. After agreeing to the initial terms of the contract with Gould, Erich Abel traveled back to Saudi Arabia to meet with Prince Rashid. It’s during this meeting that we realize how close Erich and Rashid are. Abel is asked about the work he’s doing with Saeed, and he told Rashid that he’s hired an assassin to take out their target – Rapp. After Erich left his meeting with the Prince, he made his way to a private jet that was set to take him to Moscow. What he didn’t see was a man step out from behind a curtain and approach the Prince. Colonel Nawaf Tayyib had served under Rashid during his time as secretary of the interior. His job was simple; when the time was right, after Gould was dead, Tayyib was to kill Abel, ensuring that there was absolutely no way to trace any of this back to the Prince. Now, I knew Rapp was a bad dude before reading Consent to Kill, but really look at all that goes into having him taken out! Rashid manipulated Saeed into wanting to have Rapp killed. Saeed hired Erich Abel, who was sent by Rashid, to find an assassin for the job. Using Saeed’s money, Abel hired Louie Gould to kill Mitch. Rashid then paid Erich Abel an additional five million dollars to find someone to kill Gould after he successfully killed Rapp. Erich Abel was in Venice, Italy when he got an email from Gould notifying him that Rapp was dead and he’d succeeded in making it look like an accident. Abel called Saeed, who sobbed with joy and praised Allah. Saeed had the rest of Erich’s money wired to him. By the way, after Rashid had insisted that Abel tell the killer he hired (Gould) to make Rapp’s death look like an accident, Erich went back to Saeed and demanded even more money. Yeah, this was one greedy dude! Anyways, Abel was celebrating and already planning to write a memoir years down the road. In truth, he wanted to take credit for having Rapp killed. He’d made twelve million dollars in less than two weeks, after paying Gould, and was ready to ride off into the sunset. There was just one big problem: Mitch Rapp was still alive. Prince Rashid was in Washington, D.C., on business when he learned that Rapp was “killed,” and he was working hard to hide his joy. During a meeting with Mark Ross, the Director of Intelligence, Rashid found out that Rapp was still very much alive. Ross had no idea that he was sitting across from the very man that had worked so hard to have Mitch killed, and he offered a number of details to the Prince about Rapp’s condition and whereabouts. In fact, during their breakfast meeting, Ross let slip that the only lead they had on whoever attempted to kill Rapp was that he was a wealthy Saudi man who sought revenge for the death of his son. After his meeting with Ross, Rashid was terrified and instructed Tayyib to have Abel killed immediately. Having overheard the conversation, specifically that Rapp was at a CIA safe house recovering, Tayyib explained that he knew of two such houses close by. He offered to have the safe house attacked, but warned the Prince that it would be both messy and expensive. Neither mattered to Rashid because he wanted Rapp dead as quickly as possible, so he gave his blessing to attack the safe house. Meanwhile in France, Abel was enjoying a long walk after a nice breakfast. He even checked out an art gallery, and was planning to spend some money. Walking back to his hotel, Abel decided to turn his phone on just long enough to check his messages. He was stunned to see eleven voicemails and sixteen emails, several of which were from Saeed – who wanted his money back or the job finished. The rest of the story I’m going to be pretty vague about, simply because I’m going to continue breaking the rest of it down when I write about Louie Gould later on. Essentially, these three men conspired to kill Rapp, but failed. Instead, they killed the love of his life, which in a lot of ways was worse than just killing Mitch. While Rapp was resting up at one of the CIA safe houses, a wave of gunmen, all members of a gang hired by Tayyib, attacked the property. Irene Kennedy and her son, Tommy, along with Rapp’s brother, were visiting the safe house when the gunmen showed up, and everyone on Kennedy’s protection detail was killed. Thankfully, Scott Coleman had been by the house earlier and dropped off some essentials to Mitch. Just the usual stuff – clothes, hiking boots, sunglasses … and a brand new Glock 17 pistol with hollow point ammunition. The Glock pistol came in handy as Rapp used it to kill every gunman with a single shot to the head. He didn’t waste any bullets, that’s for darn sure! Rapp continued to heal, and then set out to hunt down everyone that had a hand in killing his wife. Remember when I said Saeed’s son, Waheed, wasn’t dead? He wasn’t, at least not yet. 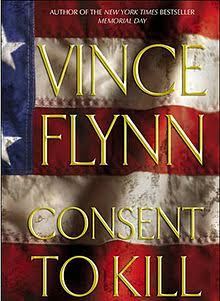 In Memorial Day, the book just before Consent to Kill, Rapp takes several terrorists hostage. Waheed is one of them, but Mitch let him live. Too bad Waheed’s dad didn’t know that, huh? Rapp went and got Waheed, strapped a vest loaded with C-4 explosives to him, then druged him up until he was somewhat cooperative. Saeed left a noontime prayer, exited the mosque, and headed towards his office. Just as he was crossing the street he saw his son – whom he believed to be dead – and went to him in shock. Just as they embraced in a hug, Rapp remotely detonates the C-4. Saeed was killed instantly, as was Waheed – this time for real. Next up, Rapp tracked down Erich Abel. Remember that secluded home in the mountains that Abel loved so much? Well, Rapp found it. After tying Erich up in a chair in the living room and questioning him, Mitch splashed a bottle of Louis XIII cognac onto the carpet flooring and into the fireplace in order to induce a house fire. Abel burned to death. Rashid practically went into hiding, but Rapp and Coleman found him. They snatched Tayyib, roughed him up, and then wrapped him in C-4 explosives before sending him walking towards Rashid’s bodyguards. Once the bodyguards were close, Rapp detonated the explosives, killing Tayyib and six other men. As for Prince Muhammad bin Rashid, Rapp threw him on the ground and stomped on his stomach. The blow to his abdomen caused Rashid to gasp for air, and as soon as he did Rapp shoved a phosphorous grenade into his mouth with enough force to shatter his front teeth. His head literally melted from his body. While Louie Gould was the one that caused the explosion that killed Rapp’s wife, it was these three men that quietly pulled the strings behind the scenes. Anna’s death had a crushing effect on Mitch, and he has never gotten over losing her. It changed him significantly, which we’re still seeing in recent novels. Rapp has become darker, less patient (if that’s possible) and more prone to taking risks. Ultimately, Louie Gould will end up much higher on my list, but these dirty bags belong in the top ten as well! 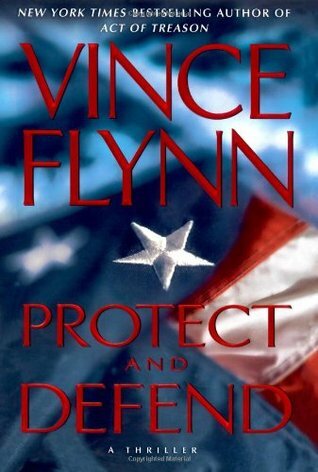 Protect and Defend is one my favorite books in the Mitch Rapp series. It has it all, and is an action packed book from the first page to the last. It opens with the killing of one of the series’ most hated bad guys – in what is easily one of the most enjoyable few chapters Vince Flynn ever wrote. As it turns out, that much anticipated kill was the just the appetizer! The plot revolves around an Israeli operation to blow up a nuclear facility in Iran. When Israel was successful and the nuclear plant was destroyed, several high profile Iranians wanted blood. The problem was that they didn’t know for sure who was responsible – the Americans or the Israelis. A man named Ashani, Iran’s minister of intelligence, was in the nuclear facility when the explosion took place. He narrowly escaped, and in doing so saved another man by the name of Imad Mukhtar. Later, the two men have a meeting with President Amatullah, and they expressed different views and opinions on how to handle things moving forward. Ashani was in no hurry to go to war with America. However, Imad Mukhtar wanted to strike a blow to America as soon as possible, and vowed to go there looking for revenge. Meanwhile, in Washington, D.C., Irene Kennedy decided to meet with Ashani in Iraq. Hoping to improve their relationship and extend an olive branch during a time of embarrassment for Iran, she made plans to travel to Mosul immediately. Irene and Ashani met in a small café, where they discussed the situation at length. Local Iraqi police set up barricades at each end of the street and kept anyone from entering the block. Across from the café, in a second story apartment, stood Mitch Rapp. Rapp didn’t like that his boss and friend was in Mosul to begin with. He definitely didn’t like that the meeting wasn’t happening at an American military base, or that the local police – who couldn’t be trusted – were being counted on for security. What nobody else knew at the time was that Imad Mukhtar didn’t travel to America after all. Once he heard the Director of the CIA was coming to the Middle East to meet with Ashani, he didn’t need to. He could strike a blow to America without ever setting foot in the United States. Mukhtar paid an Iraqi police chief a large sum of money, nearly $250,000 – which is how much the chief’s loyalty cost. To get the police officers to do as he wished, they had to be lied to. Rather than tell them it was the CIA Director coming for a visit, they were told it was a banker from Switzerland. Mukhtar watched from a dusty store window down the street, waiting for Kennedy to leave her meeting with Ashani. Along with the local police, he’d also manipulated a leader from Hezbollah into brining some of his men to join in on the fight. Together they waited. Also waiting was Rapp, who was armed with an M4 rifle that was fitted with an L-3 EOTeach optic scope. This particular model allows the shooter to take aim with both eyes open. Mitch also had a Glock. As the meeting wrapped up and Kennedy’s bodyguards escorted her to the waiting SUV, Rapp noticed something. The police didn’t appear to be watching for threats outside of the block they had sectioned off. Instead, their attention was directed inward. Just as warning bells began going off in Rapp’s head, a loud crack filled the air. A large gunfight ensued that ultimately ended in the capture of Irene Kennedy. Mukhtar controlled the gunmen from his vantage point back inside the store, but when Rapp charged into the street and began killing shooters left and right, Mukhtar strolled out into the chaos himself. Mukhtar’s men shoved smoke grenades into a hole in the one of the windows on Kennedy’s SUV, and her bodyguards piled out, gasping for air. Mukhtar personally executed them all, and then slapped Kennedy around a bit before dragging her to a separate vehicle that was waiting for them. Mitch Rapp was too late, and couldn’t stop Irene’s kidnappers from taking her. However, he did manage to take a few of his own hostages. They were loaded up and taken back to an American military base, where Rapp planned to extract information from them. Mukhtar believed that Allah had a direct mission for him; why else would he have survived the explosion in the nuclear facility? He was fueled by the anger he felt from losing thousands of men in the fight against America and Israel. He was motivated, he’d planned well and he’d successfully captured the director the world’s most prestigious spy agency. However, Imad Mukhtar made a huge mistake by underestimating Mitch Rapp – who was willing to do whatever it took to get Irene back as quickly as possible. We have never seen a more brutal Mitch Rapp than in Protect and Defend. At one point, while talking to one of the guys in charge at the base where he was torturing the men he’d captured , Mitch is a called a monster because of his barbaric methods. His point was clear, he would do anything to get Kennedy back. For what it’s worth, if Mr. O’Brien really did need a “pair,” he could probably have gotten a set from the American base in Iraq where Rapp was. When one of the gunmen that was captured refused to talk, Rapp sliced off his left gonad – then he threatened to do the same thing to the rest of the men. The majority of people thought Rapp was out of control, and worried that he was taking things way too far. One phone call to the base changed everything. President Alexander called to personally talk to Mitch, and he gave him the green light to do whatever it took to get Kennedy back. Mitch was officially let off of his leash, which is a scary thing for bad guys. Eventually one of the gunmen broke and began talking. He gave up information and names, which led to Rapp tracking down where Kennedy was being held – in the basement of a mosque in Iraq. When Mitch went to get her, he managed to kill everyone but Mukhtar, who escaped after two .45 caliber rounds missed his head. Later, back in America, Ashani was now the one offering an olive branch to Irene and Rapp. His sources tracked down Imad Mukhtar, who was hiding in Lebanon. Mitch pulled some strings and had Mukhtar arrested and held at a police station until he could get there. Rapp showed up with five million dollars, which was enough for the police chief to look the other way in regards to whatever happened to Imad Mukhtar. Rapp approached the prisoner, who was handcuffed to a table that was bolted to the floor. Taking a belt, Mitch threaded the leather around Mukhtar’s neck, looped it though the buckle, and then yanked on it. He leaned in just long enough to tell Imad, “this is for Irene Kennedy,” before he stuck his foot on Imad’s back and pulled on the belt with all his might. Protect and Defend is a fantastic book. It’s one of the most exciting, action-packed novels that Vince Flynn ever wrote. Aside from the long awaited beginning, the storyline about the Iran nuclear facility blowing up and Kennedy’s kidnapping, there’s also a really cool plotline about an Iranian submarine. This book was too good to not feature its villain on the list. Beyond just that, Imad Mukhtar really is a compelling villain. He killed Irene’s bodyguards, kidnapped her, and left a trail of bodies along the way. I couldn’t stand him from the first time I read his name, and found myself counting down the pages until he and Rapp finally met up. As always, I’ll leave you with a quote. Remember to check back next week, when I’ll unveil the fifth and sixth best villains in the Mitch Rapp series! Previous The Responses are in, Read what the Mitch Rapp Ambassadors Have to Say About The Survivor!